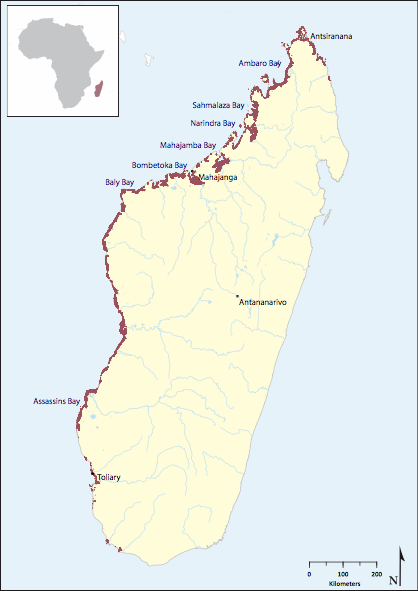 Madagascar has one of the largest area of mangroves in the Western Indian Ocean. The total area of Madagascar’s mangrove forests is estimated at 3,038.15 km2, representing about 20% of African mangroves or 2% of the global distribution. However, this estimate is likely to be significantly less due to ongoing deforestation. Approximately 98% of mangroves in Madagascar are located on the west coast, with 2% found on the north-east coast in sheltered estuaries. Five mangrove types are found in Madagascar, i.e. (i) Over wash islands, (ii) fringe mangroves, (iii) riverine mangroves, (iv) hammock and (v) basin mangroves. Similar to most other countri in the region, there are eight species of mangroves in Madagascar. Avicennia marina, Xylocarpus granatum, Ceriops tagal, Rhizophora mucronata, Bruguiera gymnorrhiza and Sonneratia abla are the most widely distributed north to south, but localized distributions of Lumnitzera racemosa and Herritiera littoralis are also found in the western regions. Mangrove forests in Madagascar support livelihood for hundreds of thousands of coastal people on the island’s west coast. Traditional uses range from timber to build houses, boats and tools to fishing and harvesting of mangrove-associated goods. Madagascar’s mangroves are critically important to the commercial fishing industry and traditional fishers, providing spawning grounds for shrimp and fish. Not only do aquatic marine creatures provide important harvestable goods to coastal communities – beetles are harvested by women to create silk, honey, and several bird and bat species which use mangroves as roosting habitat are hunted.